Posted in: Function Of The Week, New Product Features. In the ‘new world’ under MIFID II data will be King. Voluminous, quality data. For trading desks, the winners will be those who use technology to process the data by delivering actionable and informative insight throughout the entire trade cycle to validate their best execution processes. At OTAS, our edge is providing differentiated analysis of market data sets allowing traders to execute more effectively across high touch and low touch flows and also have the tools to track their individual performance both in-trade and retrospectively on a post-trade basis. 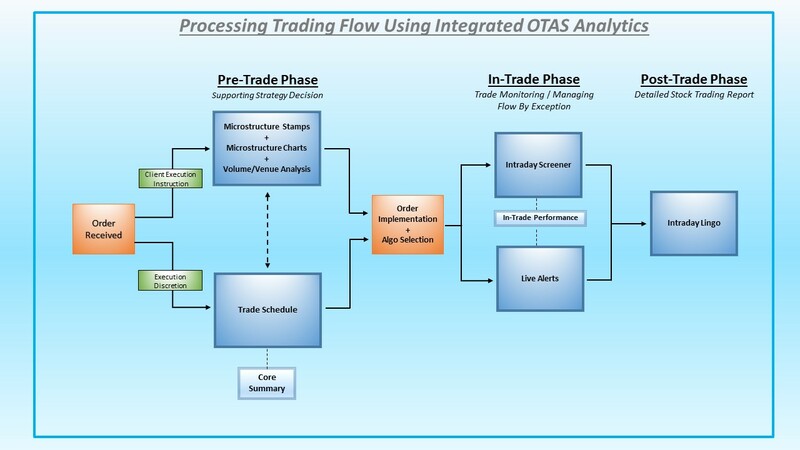 For the latter, the post-trade audit trail provided by OTAS delivers a complete narrative of market conditions and exception analysis over the life of a client order. Agnostic to trade direction or strategy implementation, traders can use this feature to annotate TCA reports to evidence and substantiate trading actions or deviation from strategy due to market opportunities that arose in-trade. Ladbroke’s share price return reached the day lows at 8.32am. All other market conditions remained normal until late morning. The shares then began to rally strongly. OTAS alerted this price behaviour being highly irregular compared to normal expectations. Traders react to this information countering the move, volume increases significantly creating an intra-day liquidity event. Price reversion observed. This behaviour is noted again shortly after as traders take advantage of similar market conditions. Following a period of price stability lit volume temporarily deteriorates. Post U.S market open, a number of exceptional high return alerts trigger creating further trading opportunities. In this example, the narrative concisely details the market catalysts to support course correction or a change in strategy implementation. Conversely, the audit trail highlights where there has been no significant market activity to benefit the trader. If a trade execution is being challenged for missing benchmark, the focus should lie with the algorithm performance and provider. The post-trade audit trail has a historic look-back feature which records and analyses daily market activity for the last 2 years, providing a best execution analysis tool used to help traders and compliance understand and attribute performance outcomes. Carrefour S.A.’s (CA:EN Paris) heavy share price reaction to last night’s profit warning should not be under-estimated. Down 14% at pixel time, the company’s lowered full-year profit and sales guidance was far from expected by the market, with key sentiment risk indicators displaying little sign of stress on OTAS. Add to this an overwhelming bullishness by ‘expert’ sell-side idea generators ahead of results and it’s unsurprising the stock is being punished so heavily. 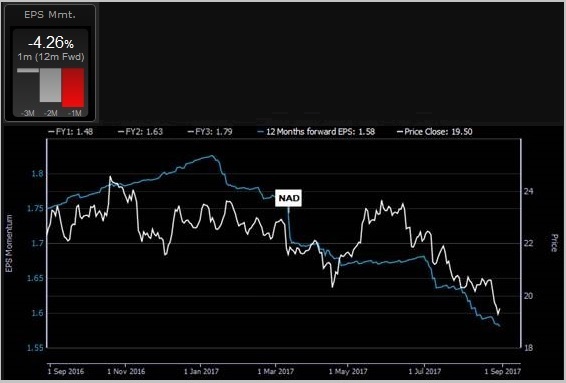 Looking at the detail, positioning in Carrefour through options, stock borrow, and credit markets all exhibited benign readings when compared to historic norms, lead indicators that typically give our clients an early warning of potential upcoming risks. For example Short Interest, a keenly watched gauge of Hedge Fund activity, was well within its 2-year average range at 6.23%, having seen a reduction from the exceptional highs of 11.5% in late June. This past week had seen only an incremental 0.8% increase heading into numbers. The sharp reversal in price could also be attributed to the high wave of optimism preceding the release. The TIM alpha capture portal indicated a strong swathe of positive sentiment from sell-side brokers who were pushing the stock. One small morsel of evidence pertaining to the potential issues besetting Carrefour was witnessed in the trend in earnings momentum. Over the last month, analyst’ forecasts were revised down by an average of 4.26%, well in excess of the sector average and placing it in the bottom 10% of all negative performers in the industry group……. although arguably this was already priced into the shares with price trending strongly with earnings momentum (see chart). As expected, the fallout from Carrefour has further hit the European Retail Index, it underperforming the broader market by around 2% intraday and leaving investors challenged to find sector alternatives. 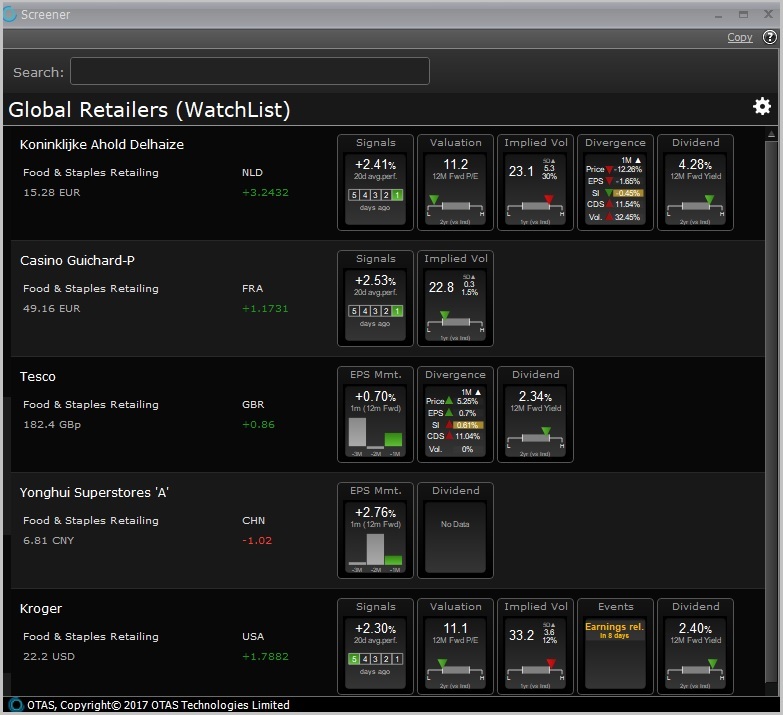 Clients with a global investment mandate wanting to re-invest in the Retail sector can use the new OTAS Screener app to identify alternative investment opportunities that are flagging positively in the wider sector. Uniquely, clients can configure Screener to either consider all OTAS core factors or prioritise just to those factors deemed most important in their investment process e.g fundamental, technical etc. If I remember back to my heady days as a trader, I was the unfortunate point-person on the desk tasked with cooperating with the Compliance team and scrutinizing any unusual patterns in our transactional data., This meant periodically reviewing a sub-set of client orders generated by a TCA exception report due to their variation in slippage from the client strategy benchmark, and then validating the disparity. It was a manual, labour-intensive process often involving trades from weeks or months in the past that typically had to be investigated at the individual execution fill level. For a relatively busy trading desk. it was incredibly difficult to recollect why strategies were changed and specific trading decisions made for many of our discretionary orders. Even less so without tangible evidence or quantitative reasoning. Today, this type of compliance process is becoming increasingly automated and more sophisticated, but the challenges remain for traders. The onus is on them to rationalize and prove out their trading behaviour. The ability to demonstrate ‘Best Execution’ is multifaceted and currently relies heavily on standard post-trade TCA reports. Yet, many do not provide quantitative historical recorded evidence that validates and supports decision making and course correction in-trade. The OTAS Intraday Lingo application does. Provides full audit history of course correction and market conditions. Hargreaves Lansdown experienced several exceptional market condition events on the 6th July. These event alerts are catalogued in a textual timeline and are also annotated on the return chart. The alerts (visible through the OTAS Alerts app) provided a potential ‘call to action’ for the trader and are recorded by Intraday Lingo as the catalyst for implementing a change in strategy. Extreme Liquidity – Outsized build in lit market bid/offer liquidity. Opportunity to spread cross using liquidity seeking algos. Low Return – Idiosyncratic price return. Recalculate participation rate based on order direction. Wide Spread – Potential liquidity issues. Consider block trading/dark aggregators (such as Liquidnet) for sourcing liquidity and spread capture. The ability to present such evidence is a must-have for traders under today’s regulatory environment and when populated with order fill data* provides a very powerful, post-trade, compliance friendly tool. One of the biggest challenges facing busy buy-side and sell-side trading desks is the ability to effectively manage large quantities of orders in real-time. 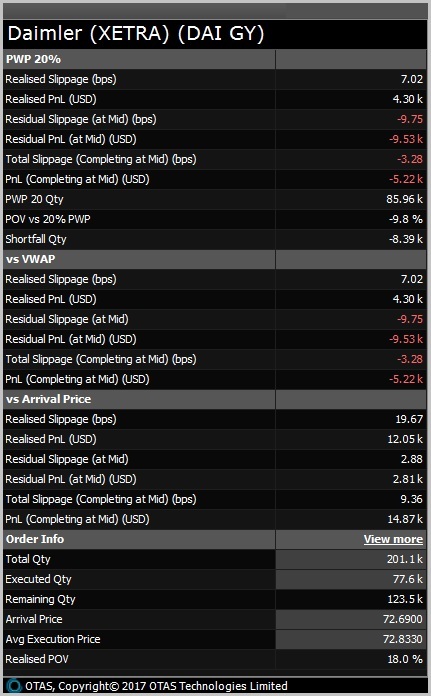 Standard pre-trade processes involve ‘bucketing’ orders within the EMS and typically prioritizing by size (in terms of percentage of historic ADV or total notional value) or other variables like expected market risk and trade impact. Orders exposing higher values for these factors would be considered ‘high touch‘ orders, segregated and worked manually by the trader. But what about the not-so-large trades or highly ‘liquid stocks,’ the type of flow that gets sent straight through the pipe into regular benchmarking algos? Should these orders be treated with any less importance than their larger counterparts just because of their rank in the trade hierarchy? A rhetorical question of course, and under the implementation of upcoming regulatory changes, trading desks need to demonstrate their ability to process and diligently execute their entire pad in accordance with best execution policies. This requires sophisticated monitoring, and it’s where technology steps in. At OTAS, we understand that traders with consistently large order pads cannot realistically manually manage all their flow every day. The key is the ability to identify the trades where they can add real value, rather than focus where they cannot. Intraday Screener solves this problem by helping traders optimise their order pad in real time. ‘Outlier’ orders are identified using the stock behaviour that the trader deems most important to their trading style; such as extreme price movements, capturing irregular traded volumes and liquidity, or monitoring price spreads. Importantly, the analysis is systematically applied across the whole order pad, meaning once the trader has applied specific scenario analysis, he/she can manage the exceptions from the smallest low touch ticket to the largest multi-day ticket on the pad. 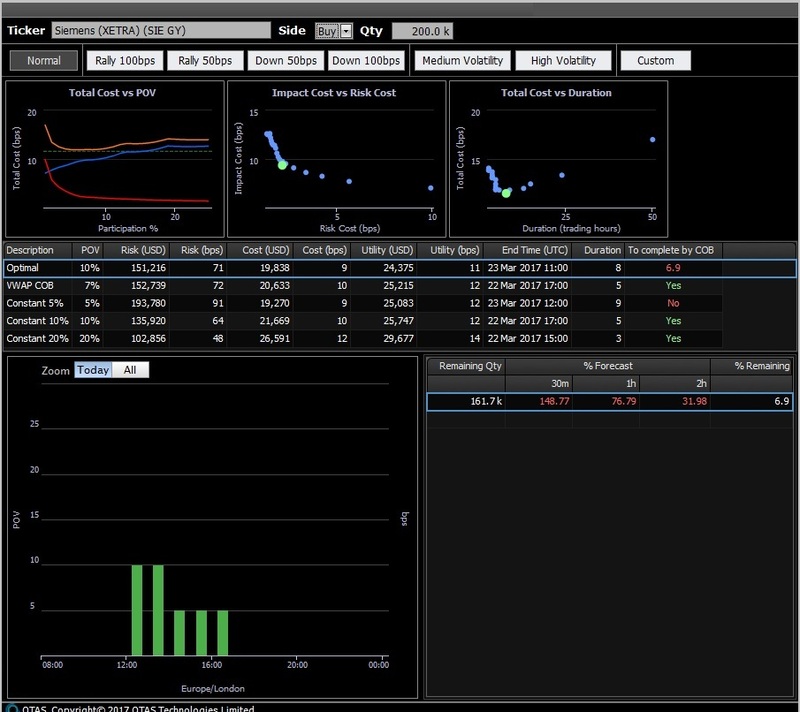 To simplify the optimization of order pads, Intraday Screener provides ‘hot buttons‘ at the top of the application, which combine multiple stock characteristics and allow traders to change views to monitor specific trading conditions to support decision making and strategy. ‘Basic‘ compares the intra-day price return (+/-) and traded volume. Stocks in the top right quadrant, for example, exhibit positive idiosyncratic price performance on higher than expected volume, which may make them easier to trade, but subject to mean reversion. A trader may want to take a closer look at an order in this security. The Basic combination of factors help traders manage orders that are reacting to new information in the market, such as trending with volume, or that are being affected by the heavy footprint of others and may mean revert when those orders finish. 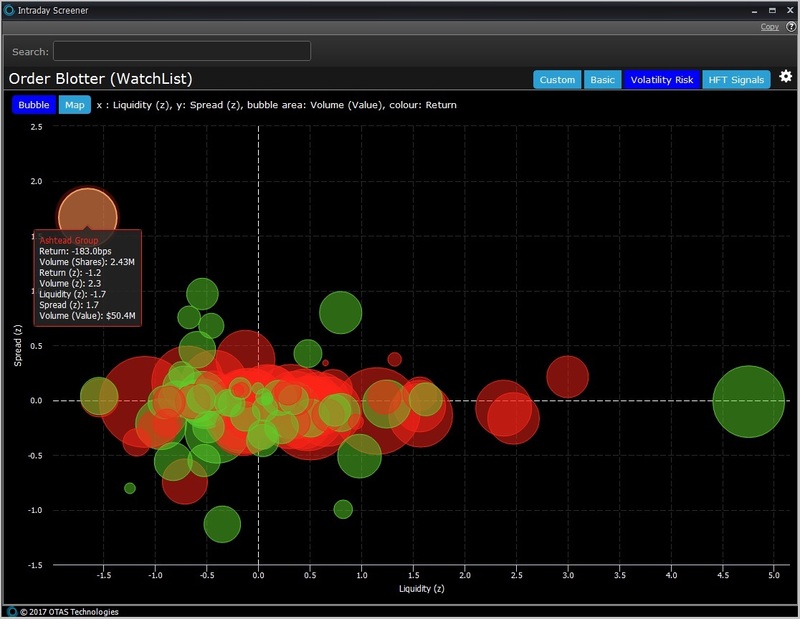 ‘Volatility Risk‘ compares the liquidity of orders on the pad with the spread between best bids and offers. Traders use this analysis to identify high impact or potentially hard to trade orders. Conversely, a stock with exceptional liquidity and low spread should be easier to trade. **Ashtead Group experiencing poor trading conditions with below average liquidity and exceptionally wide spread. 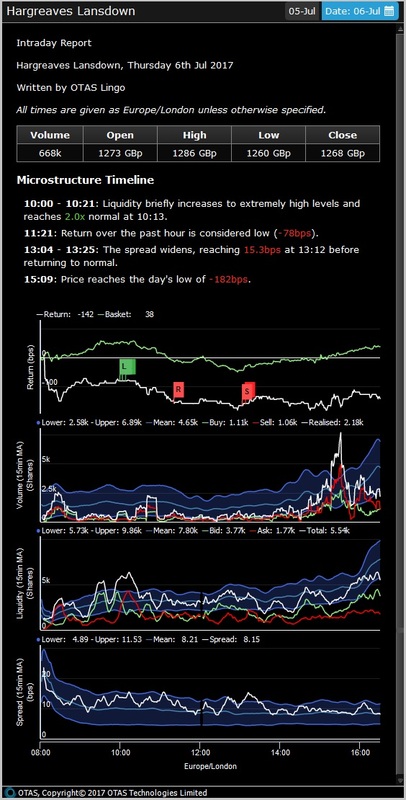 ‘HFT Signals’ compares the volume and liquidity fractions, which we define as fifteen-minute moving averages of the relative strength of buyers and sellers, in terms of posted liquidity and traded volume. A stock in the top left-hand quadrant, for example, has seen more shares traded on the bid (sellers crossing the spread) but is displaying more posted bid liquidity than offer. As with all intraday exceptions, the potential for mean reversion in this stock should be front and centre of a trader’s mind (because the HFTs are thinking the same thing). ‘Custom’, as the name suggests, allows the trader to determine the factors that show on the chart axes and determine the size and colour of the bubbles. Intraday Screener is a powerful trade-monitoring tool shaped to the factors that matter most to you and your trading strategy. In an ever-increasingly automated market, Intraday Screener ensures that you never miss an anomaly on your order pad, freeing you up to trade more efficiently. OTAS analytics are now integrated into the majority of market leading front end Order Management and Trading systems globally, strengthening our partners existing offering by providing leading edge technologies and process relevant analyses linked directly to their clients live order pads. 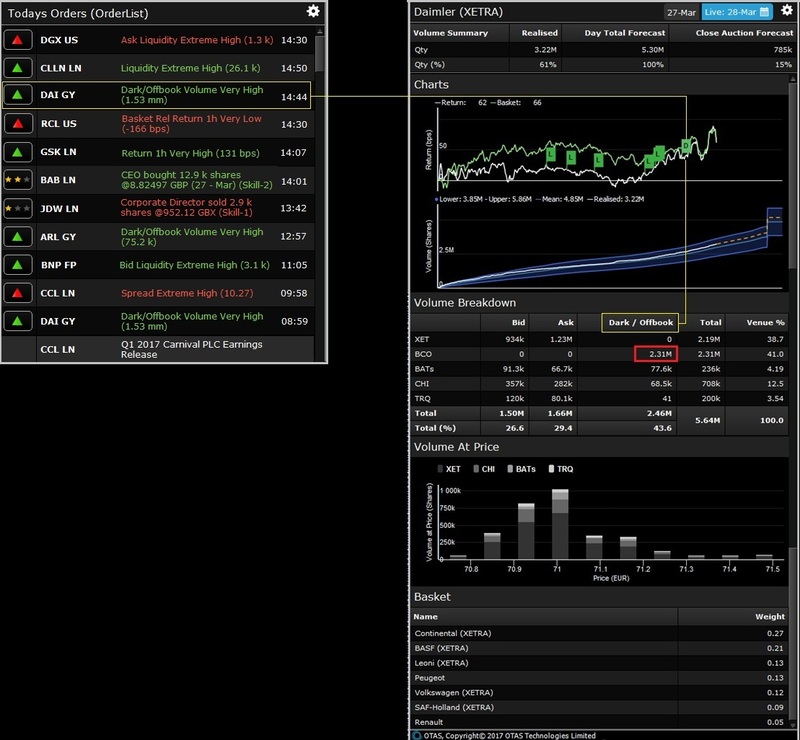 From initial order acknowledgement and strategy implementation, through in-trade exception management to the final execution fill and post-trade recording, our applications ensure each client/trader has the toolkit to maximise their execution efficiency by keeping them constantly connected with their orders(single stock and consolidated pad level) in way that provides complete transparency for every trading decision they make. This simple flow chart demonstrates how our trading analytics are applied at various stages in the life cycle of client orders directly through the traders Execution Management System. Progressive, forward thinking asset managers and trading firms understand the real need to embrace technology to create real alpha in their investment process. As the trading landscape looks set to change again in 2018 with the implementation of MIFID II, firms not using smart technologies will be heavily disadvantaged in an ever increasingly quantitative and systematic marketplace. Let OTAS help you solve those challenges. Dont get left behind, speak to us directly at otassales@otastech.com or contact your EMS provider on how we can improve efficiency, transparency and profitability across your desk. What a difference a year makes….well 10 months ! We revealed in our post-Brexit blog back in June of last year how senior directors(‘insiders‘) of the largest UK companies were using the market sell off as an opportunity to invest their personal wealth back into their own businesses by buying company stock. At the time, it was a telling signal that they believed their own companies were mispriced and undervalued, whilst simultaneously boosting market confidence about the limited impact of Brexit on UK PLC. Retrospectively it seems these directors were vindicated in their assessment. The pullback was temporary and the market has since rallied a further 14% from pre–Brexit levels and some have made a killing. So lets roll forward 10 months…..
Today’s insider analysis now paints a very different picture, well, certainly for the UK companies most exposed to fluctuations in sterling, the UK 250 Mid-Caps. 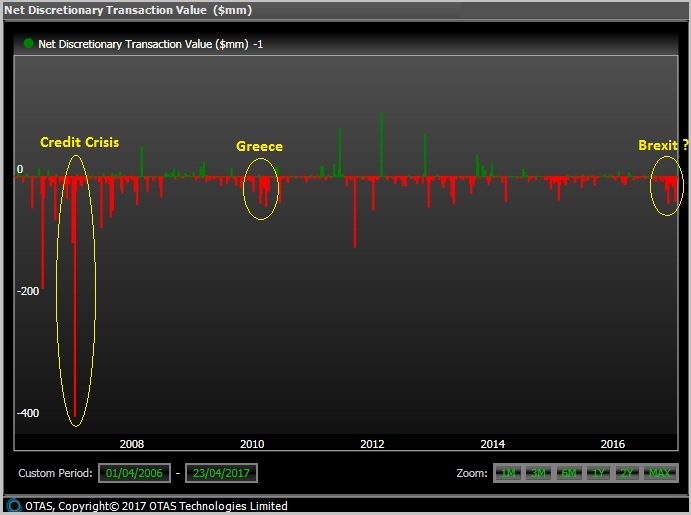 The Net Discretionary Transaction Value(Sells vs Buys) of insider transactions for this segment of the market over the last three months has seen its highest selling intensity since the same three month period in 2007. A total of £173m worth of company stock was sold from February to April, over four times more than was bought by directors. Our analysis shows there has been two real notable periods of consistent, high intensity insider selling in UK Mid-Caps both coinciding with negative event catalysts; in 2007 ahead of the impending Credit Crisis and in similarly in 2010 at the onset of the Greek Debt crisis. We also noted in our previous Brexit blog that Andrew Pidgley the Executive Chairman at UK property firm Berkeley Group had transacted the single largest individual buy trade in the immediate aftermath of the vote, purchasing c£1m worth of stock. 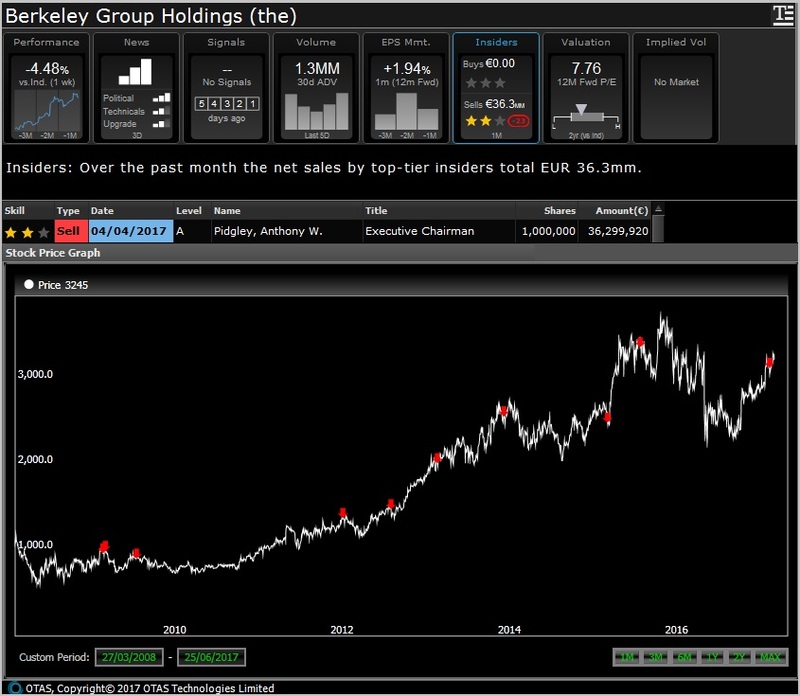 Those who use OTAS to monitor his transaction history will have seen that he has recently sold over £31m worth of stock(around 15% of his total holding,) his largest single transaction ever. Furthermore, they will have identified his previous selling history as particularly knowledgeable. With the triggering of Article 50 now discounted by the market, the focus turns to the next two years of negotiations and it will be this that has the greatest influence on UK companies. However, if the market is looking a for a proxy on the confidence of UK businesses it only needs to looks at how some of their leaders are positioning themselves now, especially in the sectors which are potentially most exposed. OTAS’ unique ability to bring multiple factor analysis and key risk identifiers together in one place gives our clients the ability to actively manage portfolios and stock positions by minimizing surprise risk over earnings season. 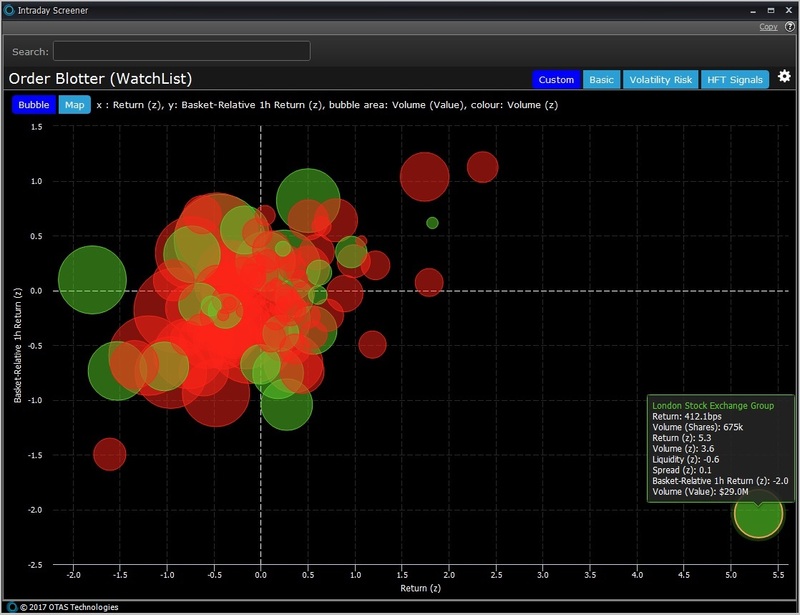 Clients with access to our Estimize earnings estimates have the ability to compare current consensus EPS data whilst additionally combining the power of OTAS’ Earnings Positioning screen and other Core multi-asset analytics to identify which of their investments have potentially elevated positive/negative price risk heading into numbers. Stock making new 52-week highs. Technical RSI of 83.5, currently the third most overbought stock in S&P500. Analyst EPS estimates remained unchanged over last month versus share price +9%. 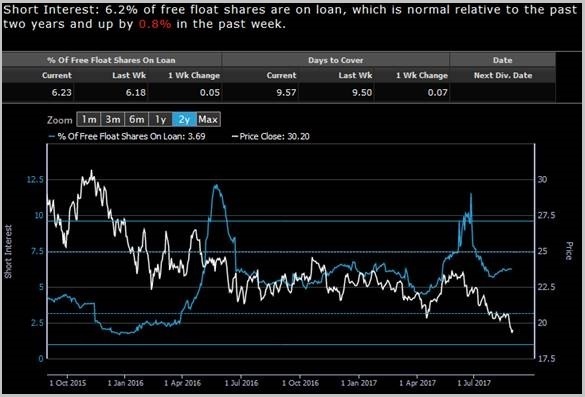 Estimize consensus expects only a 2 cent(or 2%) Q1 beat vs Wall St.
Short Interest in the last week has increased by a significant 18% to 9.11% of free float. Shares are priced to heavily beat, market EPS expectations are inline. Negative Hedge Fund positioning suggests possible ‘Travel & Arrive‘ scenario. Positive price reaction following fall in shares after negative pre-announcement in early April. Significant 1 week fall in short interest, -37% to 2.4% of free float. Pre-announced downgrades now ‘in the price,‘ strong fundamentals, heavy short covering, general consensus still expect a Q1 beat. For more information on any of our risk screening tools or trading analytics, make sure you visit our stand at TradeTech(Stand 14) over the next few days where we’d be happy to show you more. Under new MIFID II proposals the responsibilities bestowed on an individual executing trader will be under increased internal and external scrutiny. For their part, they will now be expected to be a source of alpha and value-add in the investment process whilst also providing direct accountability for the best execution of every order on the firms pad under their supervision. In the third blog of our Preparing for MIFID II series, we showcase how OTAS’ intelligent In-Trade technology is enabling traders to become more efficient through the life of a trade, by being active by exception. 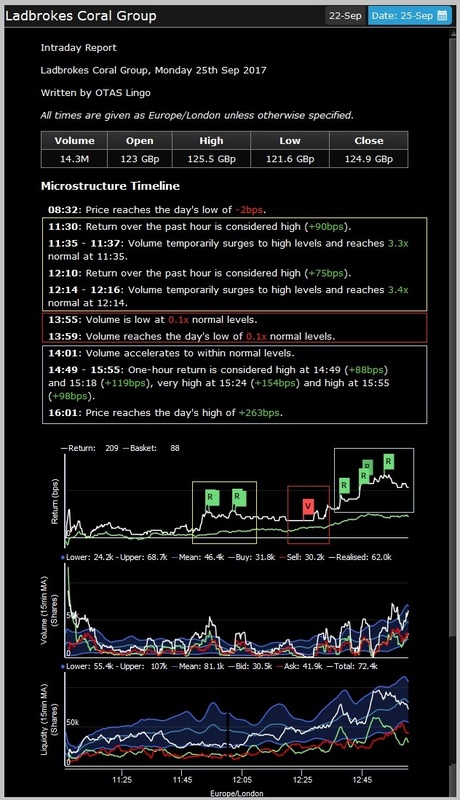 This means using advanced artificial intelligence techniques to monitor idiosyncrasies in live stock behaviour and informing traders so that they are able to reassess and reselect the best strategy for their orders in reaction to changes in real-time market information. Put simply, traders can now take real ownership of their trade blotter, optimizing their flow to the orders where they can have most impact and by providing transparent, recordable visual evidence for the basis of their decision making. 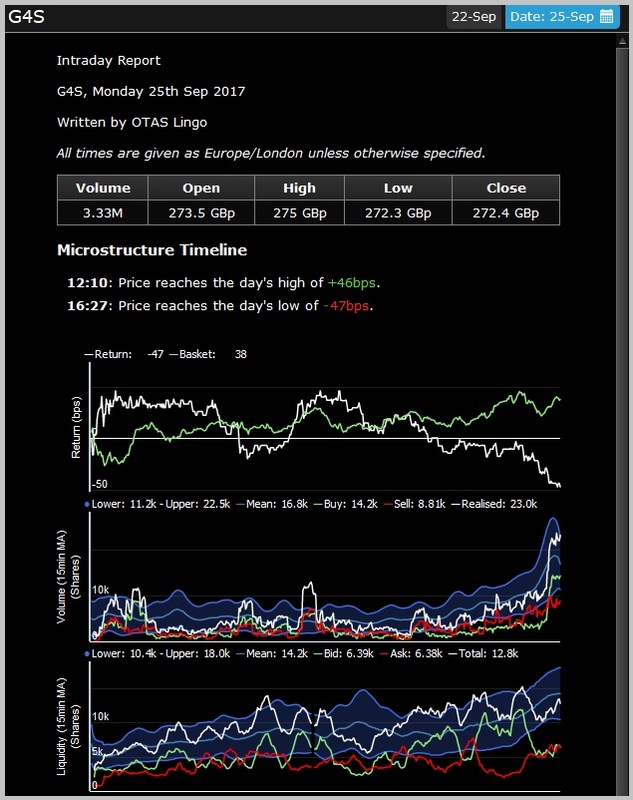 Our Microstructure charts use quantitative modelling to predict the expected daily forecasts for a range of stock trading metrics including price return(absolute and vs basket,) volumes, liquidity and spread. If during the course of an order any of these live stock conditions trade in extreme of these forecasts(through impact caused by the trader or general market) it is considered a potentially actionable signal for the trader and a visual Alert is fired. Further important price sensitive information is also relayed via the Alerts including outsized Dark/OTC volume, live company Insider transactions and Peer Event reporting. Extensive market intelligence tools including total volume and closing auction forecasts, venue breakdown analysis(Dark & Lit), V.A.P and latest News are also provided within the Microstructure stack. Systematically monitor trade blotters of any size, using an exception based approach. Alert metric(s) selectable by client preference including trigger threshold/sensitivity. 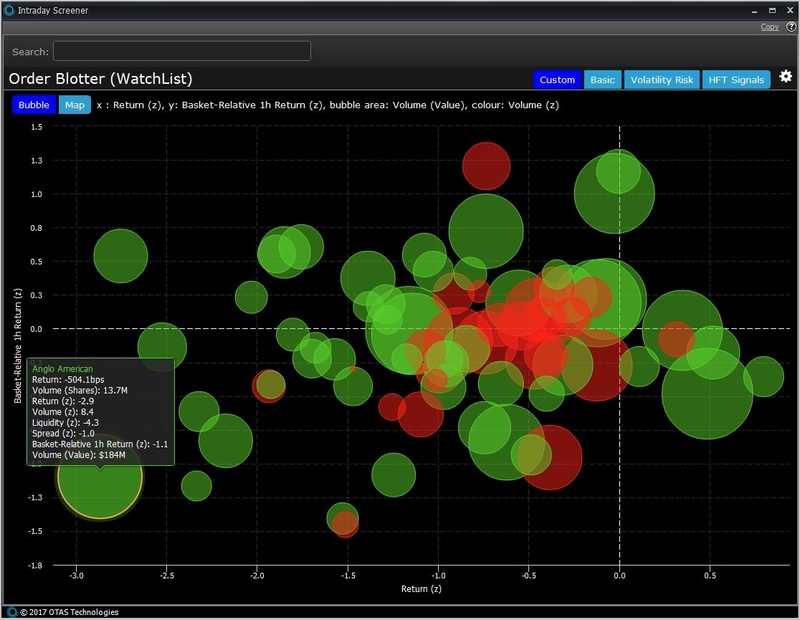 Microstructure and Alerts recorded to provide visualization evidence of traders decision process. Additionally, our In-Trade Performance function allows traders to monitor live order performance against specific client execution instructions or a range of strategy benchmarks. It also allows them to perform real-time analysis of the direct impact of their trading decisions on execution price(slippage) and participation rate. A large majority of our EMS partners now have OTAS In-Trade components directly embedded into their trading platforms, meaning their clients are already benefiting from fully integrated, optimizable execution processes. These are just three of a whole suite of bespoke real-time trading applications we have created to help Global Trading desks provide a systematic approach and facilitate ‘sufficient steps’ under the guidelines and framework of MIFID II. Under MIFID2, executing traders will be accountable for every aspect of a client order and for ensuring that a firm’s best execution policies are implemented. Ultimately, this means demonstrating the ability to record a consistent, compliance-approved process of why each decision was made. OTAS helps traders achieve this via a simple 2-step process using the Trade Schedule and Intraday Lingo applications. Traders can copy, store and send the analysis from both apps to satisfy the desk, compliance and clients. In our previous Function of the Week, we demonstrated how traders can optimize an entire order pad and distribute high and low touch orders based on exceptional trading characteristics and workflow scenarios. This week we concentrate on the individual orders that comprise an order pad, focusing on the initial stage of the execution process, Strategy selection and Implementation. The Trade Schedule component offers traders proprietary pre-trade order analysis using quantitative forecasts of stock risk(volatility), impact cost and total expected trade costs for their order size across a range of benchmark strategies. This includes our own Optimal schedule and provides justifiable decision making evidence for strategy selection and best execution processes. Each order schedule can be optionally tailored to an individual clients needs by presenting revised cost calculations based on the clients level of risk aversion. Once a strategy is selected and implemented it is then dynamically monitored in real-time, continually calculating suggested participation rates to account for changing market conditions and execution fill data throughout the life of the trade. Demonstrating ‘best possible results’ on an on-going, consistent, systematic basis. 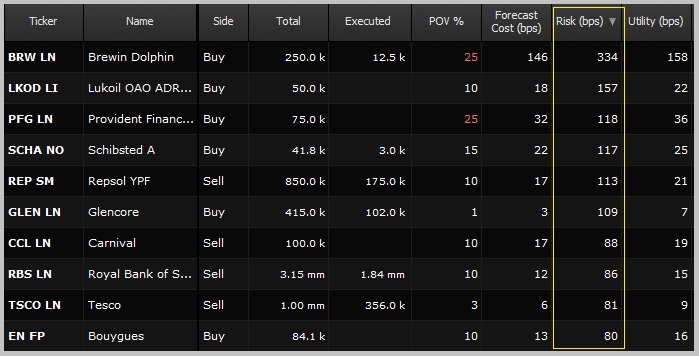 Variable cost output forecasts based on individual client risk appetite/trading style. Justification of pricing decisions for OTC risk trades. A large majority of our EMS partners now have the OTAS Schedule component along with risk, impact and total cost forecast columns directly embedded into their trading platforms, meaning their clients are already benefiting from fully integrated, optimizable execution processes. Trade Schedule analysis is just one of a suite of bespoke real-time trading applications we have created to help Global Trading desks provide a systematic approach and facilitate ‘sufficient steps’ under the guidelines and framework of MIFID II.